Before Coco Chanel became the byword for elegance we all know and revere and ever-so-slightly fear, she was Gabrielle, a gamine orphan who toils as a prim, respectable seamstress by day and entertains drunken crowds by night singing cutesy songs in bars. Not for long, however, as the plain-speaking, no-nonsense ingénue soon attracts the attention of a rich aristocrat, the boorishly jovial Etienne Balsan (Benoît Poelvoorde). Seizing her chance to improve her situation, Coco moves uninvited into his country chateau. There, at his lavish house parties, her sober, almost androgynous elegance contrasts starkly with the squeezed in, frilled and feathered frivolity of French fashion at the turn of the 19th century. But before you can say 'zut alors', the society dames are knocking at her door, demanding plain straw hats and demure orphan outfits. And before you can follow up with 'ooh, l'amour', our pragmatic, emotionally independent heroine has fallen head over heels into the arms of debonair British business man Boy Capel (Alessandro Nivola), the love of her life. Her brief dream of marriage may crash before it's ever taken off, as she learns he's engaged to an English heiress, but that doesn't stop the couple remaining firmly committed to each other. In fact, it's Boy who establishes her in her first atelier in Paris – and so a sartorial star is born. Engaging, moving and oh so delightfully French, Coco Before Chanel is as chic and classic as its heroine. But it's also as brave and deliberately unsentimental, refusing to idolize the legendary designer. So while the film is a fitting tribute to an incredibly strong lady who fought her way from unpromising origins to become one of the most influential women on the planet, it's also a clear-headed examination of the cold and at times manipulative methods she used to get there, allowing herself to be treated like a chattel by Balsan and Boy to survive. Catherine Leterrier's costumes are picture perfect, the settings sumptuous and the casting spot on. 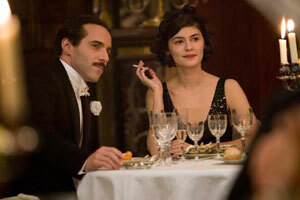 Audrey Tautou, in particular, is a revelation, giving a performance as elegant and mature as Chanel's own classic couture – and, one suspects, as timeless.